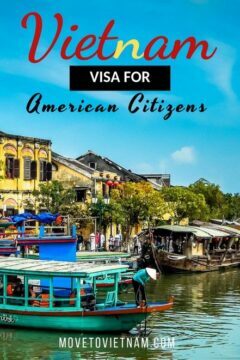 If you are from the US and planning to either move to Vietnam or travel here, you should know that you have some advantage when it comes to visa options. We've tried to find out how come Americans have a more flexible option, however, we couldn't find out why - so if you know the reason/s let us know. The first thing you need to know is that US citizens are not visa-free to enter Vietnam. You need to apply for a visa in the embassy, travel agency or online, Vietnam doesn't offer a visa on arrival either. TIP: You may use the table of contents to navigate faster. There are three ways to get yourself a visa for Vietnam; e-visa, through a travel agency or online, and through the embassy/consulate. Below, you will get more information about these visa options - how to get it and how to use. If you need a visa to enter Vietnam, there are two things about visa; one is the actual visa sticker and the other is an invitation letter. If you have the visa sticker on your passport, you can use this at any point of entry (air, sea or land). 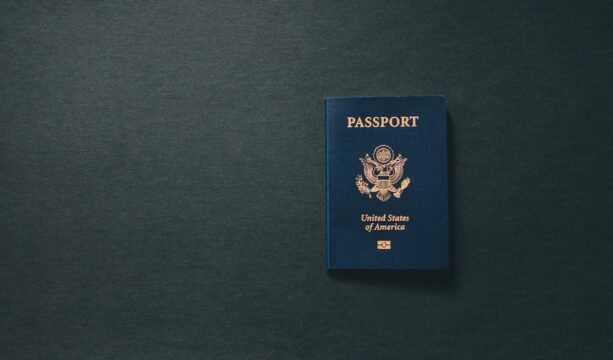 Normally, the visa sticker can be processed through an embassy or consulate and a travel agency who can send your passport to an embassy or consulate. While if you have an invitation letter, which you can normally get online or from a travel agency, you can only use this to enter Vietnam via air and most likely through a specific border. It's possible to use it via land if the travel agency/website write in your invitation letter the specific land border point. You need to remember that if you are using an invitation letter, you will need to pay for the stamp/sticker fee which varies depending on the visa length and if it's a multiple or single entry/ies. You can either head here (the official website - it takes a few days or weeks to process ) or to our recommended website (3 business days). E-Visa should only be used when entering Vietnam via air or land borders, however, you have to make sure that you enter through the points that you put on your online application. 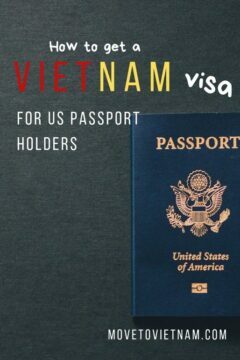 You should also have US Dollars with you when you enter/land Vietnam to pay for the visa sticker which is $25. An e-visa is valid for a maximum of 30 days with a single entry rule. If you want to stay longer, you can look into extending your Vietnam visa or get a new e-visa. If you prefer to get a new e-visa, you must exit the country and re-enter again. Going through a travel agency is also an option and pretty popular, however, the scams are sometimes inevitable. You should do your research and read reviews about the travel agency you are planning to have your visa processed. Travel agencies can be contacted online, normally, they will ask for a copy of your passport, passport photo. entry date, and entry and exit point. They will also ask some questions, for example, the days you are going to stay and if you need multiple entries or just a single one. Travel agencies can also be approached in person especially if you are coming from Cambodia or Laos or Thailand. If you are going through a travel agency in the mentioned countries, they should be able to provide you with the actual visa sticker, make sure to clarify this before paying. Travel agencies can also provide you with an invitation letter. If you want a hassle-free visa processing way, getting it online is a great option. All you need to do is to fill out the information needed, pay online, and wait for the email of the invitation letter. All visas that are processed online are invitation letter only, which means you need to pay for the visa sticker when you enter or land in Vietnam. To make sure that you are using the reliable website, read reviews from clients they previously served; Facebook page, TrustPilot, blog reviews, etc. Here, in Move To Vietnam, we highly suggest iVisa for their fast and secure services. Personally, we have used them and we have been recommending them to our friends and readers - we have not heard any complaint so far. NOTE: Online websites can only provide an invitation letter which you present to the immigration when you enter Vietnam. Of course, the safest way to get your Vietnam visa is through an Embassy or Consulate, they probably the most affordable. However, due to the number of applications they have to process, they are a lot slower and sometimes complicated to work with compared to travel agencies or websites. Getting a visa from an Embassy or Consulate also means that you will receive the visa sticker and not an invitation letter which means you can use your visa in any entry point. For some reason, US citizen is the only nationality that can get a one year visa or six months; both for tourism and business visa. Many expats are teaching English in Vietnam and many of them are working on a tourist visa which is illegal and can get you in so much trouble. However, if you have a business visa, this allows you to legally find a job and work in Vietnam while waiting to process your work permit or Temporary Residence Card. This one-year business visa gives many Americans more flexibility and saves money. If you go through a travel agency or a website, they can provide you with an invitation letter, which contains your details. You will present this to the immigration once you enter Vietnam. If you are using an invitation letter, you will need to pay $25 (single entry) or $50 (multiple entries) for the visa sticker/stamp fee. Remember to bring US Dollars with you. The prices vary depending on where you are applying from. Embassies and consulates are the most affordable, travel agencies and websites add a little service fee, which is pretty fair because you don't have to spend money on transportation to the Embassy or Consulate, waiting in line, and spending more time going back and forth. We hope that you found this article about Vietnam visa for US citizens useful and informative. If anything is unclear or you think we missed something or made mistake, let us know in the comment section.